Newfoundland is due for completion in 2019. The 220m building will have 62 floors in total, of which 57 are for residential built-to-rent apartments and the remainder will house the plant room, restaurants, a gym and a residential play space. Our client is Canary Wharf Contractors Ltd, the architect is Horden Cherry Lee Architects and the detail architect is Adamsons Associates Architects. The Newfoundland project team for WSP comprises of project directors Kamran Moazami and Jack Adams, associate engineer Chris Gosden. The project has benefited from support of our global specialists from WSP New York to WSP New Zealand. Steve Bosi and Rimmy Vij are also providing support from WSP facades. We talked to project associate, Chris Gosden, about how the challenges of this unique building called for a structural design solution that both enables and influences the architecture. Watch our Hidden Marvels animation explaining how we overcame the site constraints. “The core rose quite rapidly, with the diagrid structure following on closely to provide structural stability. Within the diagrid we have used different types of construction to create the floor plate. On the intermediate floors between the nodes, we have a concrete post-tension solution which allows for thin slabs and reducing the amount of reinforcement. At the node floors we have a steel beam solution with pre-cast units creating a deck between the beams. Because of the building’s diamond shape and the geometry of the diagrid we have focal points at the nodes which cause forces to kick out from the building. As a result, we have to tie the building back in, and to do this we have engaged the whole structure, sharing the load between the perimeter tie beams, beams that tie back into the slab, and slab diaphragm and its structural topping, which is extensively reinforced, all creating a stiff disc. The node floors have been constructed using precast concrete slabs. This creates a platform from which to build the next 4 floors of the diagrid but it also separates the work above from the construction of the intermediate floors below. This means that a faster construction can be achieved. The intermediate floors are formed of post-tensioned concrete. The thinner slabs help to reduce the total self-weight of the building. This is a section of the former southern wall of the West India (middle) Export Dock in East London, built between 1803 and 1806. A survey in 2001 revealed the skilful engineering involve in the wall’s construction, the main brick build incorporating a curving or banana-shaped section both for structural stability and to accommodate the profile of ship’s hulls. It is the earliest known example of reinforced brickwork. 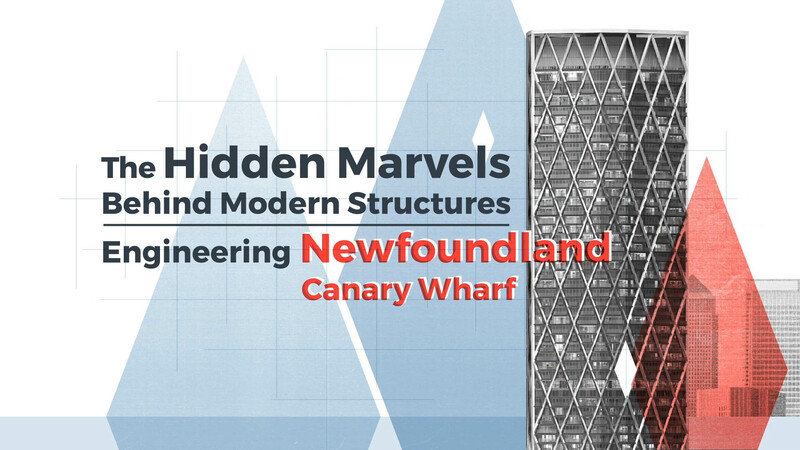 Newfoundland, Canary Wharf, Construction Timelapse from Canary Wharf on Vimeo.